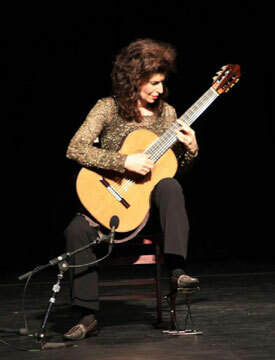 Sharon Isbin is a world-renowned guitarist who has performed classical guitar all over the world. She honed her craft by playing concerts for music classes in St. Louis Park schools. After graduating from Park High she studied at Yale. Since 1989 she has been the first and only chair of the Julliard guitar department in New York City. For more information, visit her website at www.sharonisbin.com. Sharon’s father Herbert Isbin was a Professor of Chemical Engineering at the U of M. The family moved to St. Louis Park in about 1953, building a house at 2815 Monterey Parkway, which backs on to Fern Hill Park. Sharon was born on August 7, 1956. Sharon Isbin performing at the St. Louis Park High School All-Class Reunion, August 25, 2012. Photo by Richard Novak.